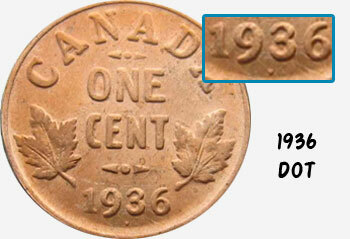 The rarest and most desirable coin in Canadian history is the "1936 dot" one-cent coin. Only three are known to exist. Why were they struck? On January 20, 1936, King George V died shortly after his 71st birthday. As is customary with Canadian coinage, if a monarch dies anytime during a year, his/her portrait remains on all the coins minted in that year. George V was succeeded on the throne by his eldest son, Edward VIII. Anyone with even passing knowledge of the history of the British royal family ought to know that Edward VIII abdicated late in 1936 in order to marry American divorcee Wallis Simpson. He was succeeded by his younger brother, who became George VI. This presented a problem for the Royal Canadian Mint. It had already prepared dies for its 1937 coins with the likeness of Edward VIII, which were now outdated and useless. It was feared that the new dies with George VI's head would not be ready for striking in 1937. The mint conceived a backup plan: They would reissue the 1936 coins bearing George V's likeness, but place a dot below the 1936 date to indicate they were made during the 1937 mintage year. Only three samples of the one-cent coin bearing the distinctive dot were struck--and all three were kept by the director of the mint. As it turned out, the dies for 1937 with George VI's head were ready in time for 1937 strikes, so the 1936 dot coins were not needed. One of the three rare coins sold at auction in 2013 for about $250,000 U.S.